We have many new and exciting events to share with you! 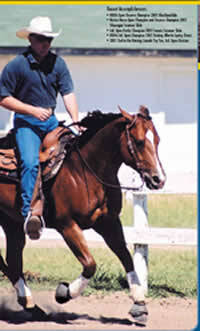 The following clinics and demonstrations conducted by Clay Webster throughout 2002 and 2003 are for all horse enthusiasts looking to better, or progress their relationship with horses. stopping slides, lead changes, perfecting the spin, mental preparation to health and maintenance, plus much, much more! Starting approximately ten years ago, Clay developed an honest, non-gimmick program that allowed him to deal with problem horses, start young horses, and prepare and show horses of different breeds and disciplines.